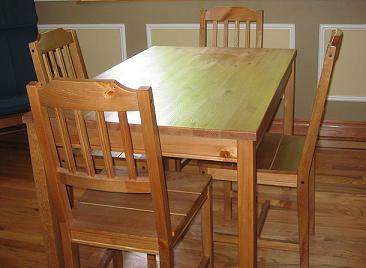 A wooden kitchen table with chairs. В ко́мнате стои́т большо́й стол. There is a big table in the room. The guests sat at the table. Анто́н взял газе́ту со стола́. Anton took a newspaper from the table. Katya is laying the table. По ру́сской тради́ции за столо́м при́нято бесе́довать. According to a Russian tradition it is usual to have a talk during meals. Он позвони́л в стол нахо́док. He called the lost and found. Home cooking is always tastier. Официа́нт поста́вил ко́фе на стол. The waiter put the coffee on the table. Когда вы ви́делись с отцо́м в после́дний раз? literal Ask a pig to sit at the table and it will put its legs on the table. Пироги со стола, друзья со двора. literal Pies off the table, friends off the yard. Недосол -- на столе, пересол -- на спине. literal Insufficient salting -- on the table, oversalting -- on the back.